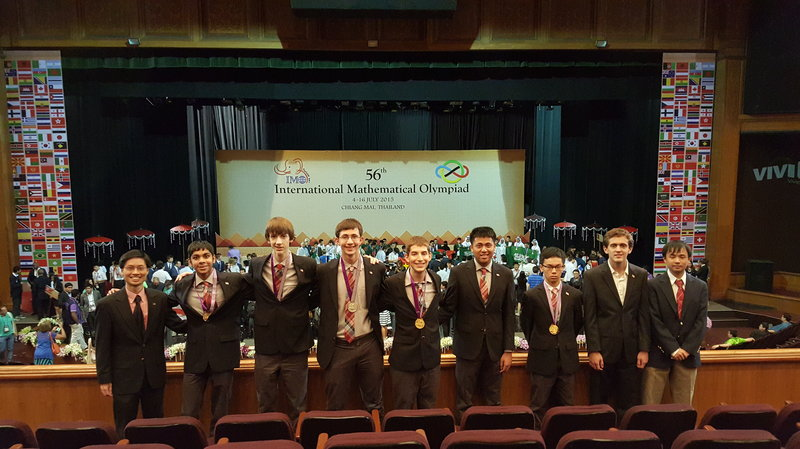 For the first time since 1994, a team of top-tier mathematics students from around the United States has taken first place at the International Mathematical Olympiad, a global competition that this year included teams from more than 100 countries. Po-Shen Loh, a professor at Carnegie Mellon University and head coach for Team USA, says the competition is held over the course of two days. Students work on three math problems each. The atmosphere at the Olympiad is intensely still. Relatedly: You may not be able to tackle any of the problems posed at the Olympiad, but if you’d like to try your hand at a puzzle that, in 1995, flummoxed 96% of America’s top math students, you can do so here. Contact the author at rtgonzalez@io9.com. Above: Head coach Po-Shen Loh (far left) and assistant coaches John Berman and Alex Zhai (far right) flank the members of the winning squad: Shyam Narayanan, David Stoner, Michael Kural, Ryan Alweiss, Yang Liu and Allen Liu. Photo Credit: Po-Shen Loh via NPR.